The catamaran can accommodate up to 8+2 guests in four separate spaces in the hulls including 2 deluxe cabins and 2 VIP cabins. Each of them designed to the smallest detail to bring comfort and pleasure. All decorative elements in the VIP cabins are 100% pure Italian linen, strongly desired by the owners, like pillows and a bottom quilt. Their inspiration were the colors from the Mediterranean and the Caribbean Sea as well as the blue sky. The result: the perfect high quality fabric shades of blue, aquamarine and white. A superior level of luxuriousness is also achieved thanks to shimmering silver headboards. The cabins are equipped with comfortable king-size beds, wardrobes and retractable TVï¿½s. 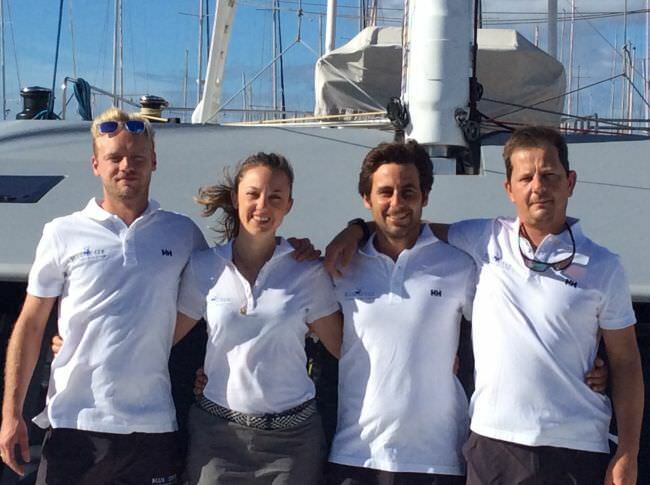 Alfredo has obtained a MCA Yacht Master Offshore certification and a Marine Engineering Master. During the last 10 years he has sailed all over the Mediterranean and in the Caribbean Sea, crossing the Atlantic Ocean many times. Friendly and open-minded person, he does everything possible to make unforgettable every moment spent on board, even trying to exceed the guests’ expectations. Alfredo has a big passion for sailing, in fact he has started when he was 8 and for the next 15 years he has kept sailing at international level. As engineer, he has worked on the construction of modern superyacht, developing a high technical background. He will take you to the most charming places and he will be honored to share with you his passion, always guarantying an excellent standard on board, surrounded by a magical atmosphere with the sea as a background. Alfredo welcomes you on board. Very friendly and gentle, Claudio knows how to be present and discreet at the same time. Sea and open-air activities lover, he started sailing at the age of 13 and skydiving at international level. In 2000, he transformed his biggest passion into his job, thus becoming a sail boat skipper, working on 70 feet boats. With his kindness and the support of our best water toys, he will assure you incredible snorkelling sessions, water sports and, obviously, he will take you to the most beautiful sandy beaches in the area. Eleonora, radiant and cheerful, is the hostess of Blue Deer. She will take care of you from the first step on board, until the end. She will be able to satisfy your desires, making your vacation unforgettable. With a relevant experience in the hospitality management inside Five Star Hotels all over the world, from the United States to the United Kingdom, Eleonora has developed a meticulous attention to rigor, so that she will always make your wish come true, starting from the cleaning, to services, including the flowers. His passion for cooking has brought him around the world, where he has worked with famous Steel Chefs, and in prestigious hotels. There, he has developed an excellent customer service attitude and a methodic organization. Since 2016, Giuseppe has worked as a Chef in private yacht, attending many trading courses and incrementing his abilities to sail in difficult weather conditions. He is very skilled at team interaction and working across groups. Giuseppe is specialized in gourmet food, but he also pays particular attention to the tradition. He guarantees high professionality and a variety of dishes.